SAN DIEGO, CA-The Gaslamp has become the hip and upscale historic district of downtown San Diego, located near the city's top-line sports complex, Petco Park, and the San Diego Convention Center. A landmark attraction in the Gaslamp is the new Stingaree, a luxurious, 3-level, 22,000-square-foot facility for dining and entertainment located in an old warehouse at the corner of 6th and Island. 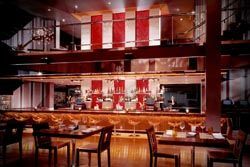 Stingaree's ground floor houses the facility's restaurant flanked by towering wine racks and a floor-to-ceiling waterfall, and features Martin Aduio's Blackline F212s and AQ212 subwoofers, along with 14 Electro-Voice EVID fill speakers. Stingaree's rooftop garden provides a place to get away from the action and cool off with a reflecting pool, the source of the waterfall below, tables, another bar, and greenery around the perimeter of the roof area. The owners, wanting to provide the highest level of audio throughout to maintain consistency of quality in sound and video, chose Brad Donaldson and Pro Systems AV for the install. When asked about how much flexibility he had in choosing the audio gear, Donaldson replied, "They gave me flexibility to spec the gear I wanted. My experience with Martin Audio made them the obvious choice." In terms of the system, five W8LMs (mini line arrays) are flown on each side of the main dance floor, powered by Martin amps with four S218 subs on the floor. The restaurant/late-night lounge features Blackline F212s and AQ212 subwoofers, along with 14 EV EVID fill speakers. "We had to be creative with the main speaker hangs because of the curved mezzanine overlooking the dance floor, and a bridge going directly over the dance floor," said Donaldson. "The smooth coverage of the w8lms allowed us to cover the area with two hangs."